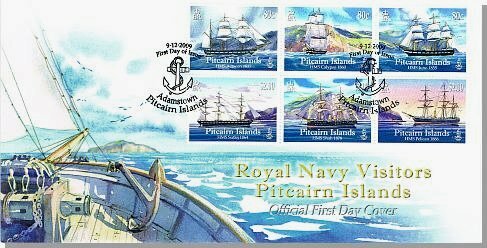 Pitcairn’s rich inheritance was born from a momentous Royal Naval historical incident and this issue focuses on some of the RN vessels that have yet to be commemorated in a stamp issue. These ships came for various reasons including survey missions, transportation of Pitcairners and missionaries, medical support and ‘policing roles’. In addition they assisted with census records, delivery of mail and supplies, the recording of Island life and the raising of Bounty relics. HMS Actaeon – built in 1831, she visited Pitcairn in 1837 under Commander Lord Edward Russell to make enquiries about Joshua Hill, the self styled ‘dictator’ who had arrived in 1826. A full enquiry highlighted his unpopularity and led to his banishment later in 1837 aboard the frigate HMS Imogene. HMS Juno – the prime reason for this visit in 1855 by an Australian based man-of-war was to ascertain whether the inhabitants of Pitcairn would be willing to be taken to Norfolk Island. This was decided on a vote of 153 to 34 and took place in 1856. The Juno floundered in the Atlantic in 1880 with all crew lost. HMS Calypso – visiting in 1860 for only a short period of 12 hours, Captain Montresor’s task was to ascertain the numbers of Pitcairners who had returned home. He found dilapidated buildings including the church and schoolhouse but with animals in abundance. The school was well stocked by the Captain before he sailed to file his report. HMS Sutlej – Built in 1855, her visit to Pitcairn in 1864 was to carry out a census, leave some supplies and administer medical treatment where needed. Commander in Chief of the Pacific Station, Vice Admiral John Kingcome invited the Pitcairners onboard during this one-day visit. The Sutlej was broken up in 1869 after just 14 years service. HMS Pelican – this composite screw sloop anchored in Bounty Bay in 1886. Aboard was John Tay, who introduced the 108 islanders to the Seventh Day Adventist faith. Given permission by the Pitcairners to reside and present the teachings of the Seventh Day Adventists, he stayed five weeks. At the request of the islanders Tay promised to return with an ordained minister of the faith to baptise those wishing to become members of the Church. 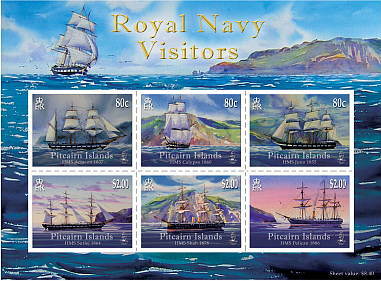 Sheet Format: Miniature sheets of 6 stamps. Size 140mm x 103mm. 9 December 2009 for a period of 2 years. Acknowledgement: The Pitcairn Islands Philatelic Bureau would like to acknowledge the invaluable help of Graham Ford who suggested the idea and supplied reference material. Herb Ford’s ‘Port of Call’ was also called upon as reference in the bulletin text.